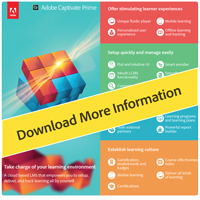 Adobe Captivate Prime is an LMS with a learner-1st approach. Users seamlessly engage with almost any kind of eLearning content through Adobe's new fluidic player. Gamification features help shape a culture that makes learning more than a necessary task. Setup is simple and Administrators can roll out new learning opportunities in as little as 90-minutes. It’s a next-gen Learning Management System (LMS) that delivers personalized learning experiences across multiple devices. Align all online and offline enterprise-wide learning initiatives to skill, upskill and reskill your employees. Adobe Captivate Prime - A cloud based LMS that empowers you to setup, deliver, and track learning all by yourself. ed playback experience for virtually any kind of content, so that they can play videos, PDFs, PPTs, DOCx, SCORM and AICC-compliant packages, all within a single player without having to download any plugins. ine access and auto-syncs when the learner is back online.